It’s 9 am. You’re in New York City, armed with $14 (50 dirhams) and no plans. Start your day by walking to to Union Square for the Greenmarket, a farmers’ market that transforms the west side of the square into a cornucopia of fresh produce, artisanal treats, and pleasing chaos. Meander around the market, and you will find New Jersey-picked Honeycrisp apples (75 cents each), sprouted whole-wheat croissants ($3), and New York grapes. When you’ve had your fill, walk west to the Highline on 10th Avenue. 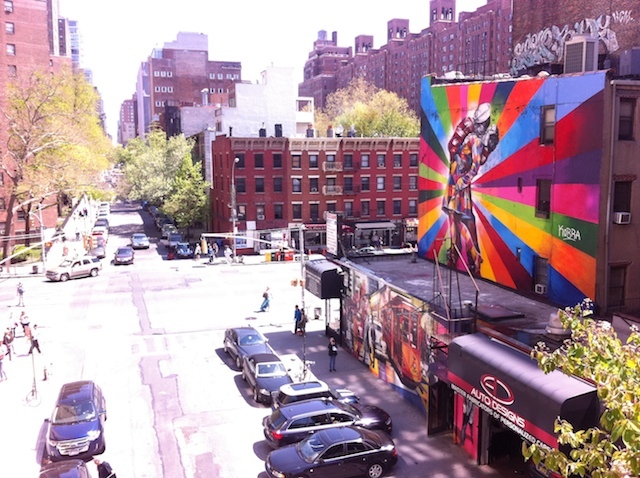 Enjoy the window displays of shops and cafes as you mosey uptown to 20th Street, where you’ll stumble upon the densely populated Chelsea gallery district. Galleries are open to the public and free. When you’re done Instagramming select works from the galleries, walk east to General Worth Square between Broadway and Fifth (near Madison Square Park). These restaurant tents house every cuisine, from New Orleans style gumbo and Asian-inspired hot dogs to Roberta’s Pizza and Sicilian rice balls. One dish at any of these restaurants should be about $6-7. For $5, purchase a pay-per-ride Metro Card and take the 6 train uptown to 68th street. Amble west to Madison Avenue and, walking uptown, you will come across the Frick and the Whitney Museums. Flash your NYU student ID and you have free access to an afternoon of art! In addition, the Metropolitan Museum of Art on 82nd Street is donation-based, so pay what the art is worth to you (as little as one penny). Make sure to head to the roof before 5 pm, where you’ll find arguably the best view of the city along with great drinks and Astroturf made for napping. Here’s where I leave you: on the top of the Met at sunset. Finish the day by getting lost in Central Park (it’s much easier than you think).